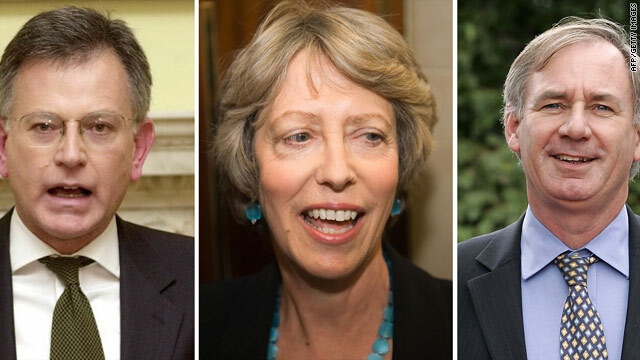 Stephen Byers, Patricia Hewitt and Geoff Hoon have all been suspended from the Labour Party. London, England (CNN) -- Britain's Labour Party suspended four members of Parliament -- including three former Cabinet ministers -- after they were secretly filmed offering to sell their government influence, the party said Tuesday. The party said it has launched an investigation of Geoff Hoon, Patricia Hewitt, Stephen Byers and Margaret Moran and suspended all four from the Parliamentary Labour Party. None of the four plans to run in the next election, expected to be held in May. "The Labour Party expects the highest standards of its representatives and believes that they have a duty to be transparent and accountable servants to their constituents at all times," the party said in a statement. What the British media has now dubbed the "cash-for-lobbying" scandal comes just weeks before the expected general election in which Labour, the ruling party, faces a stiff challenge from the opposition Conservatives. Cabinet Secretary Gus O'Donnell, a non-partisan official, called the allegations "extremely serious." The undercover filming was done by reporters for Channel 4's "Dispatches" program, which aired Monday night. They set up a fictional U.S. company that claimed to want to hire British politicians for an advisory board, and an undercover reporter then invited the MPs to a rented office in London to discuss the work. A hidden camera captured the politicians agreeing to use their experience and influence to lobby the government in exchange for thousands of pounds (dollars) in pay. "I'd be very interested. I'm a bit like a sort of cab for hire, I suppose, at the moment," said Byers, who was the transport and business secretary under former Prime Minister Tony Blair. Byers said he usually charges a daily rate of between £3,000 and £5,000 ($4,500 and $7,500) for similar work. Among the services Byers offered was to try to get Blair to show up at a client's event. "The three to five just depends a bit on the work, the clients, to be honest," Byers said on the tape. "I mean, sometimes I can charge more." Hoon, who was British defense secretary during the invasion of Iraq in 2003, said he would request a similar amount. He said he could lead delegations to see certain ministers, or he could write letters to ministers to persuade them to see a client. "One of the challenges, I think, which I'm really looking forward to is sort of translating my knowledge and contacts about (the) international scene into something that, bluntly, makes money," Hoon said. Lawmaker Margaret Moran, who was implicated in the parliamentary expenses scandal last May, was also shown on hidden camera to be interested in a possible job. Moran spent £22,500 ($33,700) of taxpayers' money for repairs on a seaside home far from her constituency, days after declaring it as her second home, records last year showed. Moran told the undercover reporter that she would be willing to approach parliamentary committees or special advisers on behalf of the company. Hewitt, who served as health secretary and trade and industry secretary in the cabinet, said she is looking for another "major board position" to employ her for three days a month. Asked how easy it would be for her to arrange meetings with Cabinet ministers or senior civil servants, Hewitt replied, "It's very doable, but you have to be kind of quite careful, you know, about how you do it. And it partly depends on the individual minister." The Conservatives called on Prime Minister Gordon Brown to launch an investigation into the scandal. Peter Hoskin, a columnist for The Spectator magazine, described the revelations as "dirty money and dirtier politics." "Our democracy could hardly bear another major political scandal, but here we have one: as grubby, underhand and dispiriting as last year's expenses revelations," Hoskin wrote. "The question now is whether it's as widespread." Daily Telegraph columnist Mary Riddell called it "the week that could finish Labour" and said it put the Conservatives, also called the Tories, in a good position ahead of the election. "Any hope that the shadow of greed had lifted was crushed by accusations that former ministers sought money for favors," she wrote. "The taped claim by Stephen 'Cash' Byers that 'I'm like a sort of cab for hire' is a remark geared to give the Tories a chauffeured drive to power."